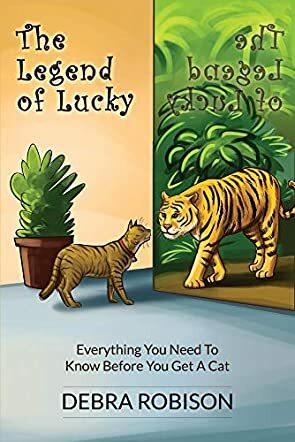 The Legend of Lucky: Everything You Need To Know Before You Get A Cat is a nonfiction animal care book for children written by Debra Robison. Debra and her husband considered themselves to be as lucky as Lucky was, when their daughter Amber and her husband asked if they’d consider making their rescue kitten a member of their family. Amber and Ryan already had three cats, so finding a new home for the kitten Ryan had rescued made a lot of sense. It made sense for Debra and for Lucky too. Lucky liked having his own home and loved the backyard that came with it. Any time a family begins planning on adopting a companion animal into their family, the necessary care and maintenance to keep that animal happy and healthy must be considered. This is especially so when there are young kids involved. In The Legend of Lucky: Everything You Need To Know Before You Get A Cat, Debra Robison shares the story of her rescue cat, Lucky, through both her own story and that of Lucky himself. She discusses feeding, litter boxes, vet care and understanding that cats and dogs have feelings just like people. She includes a checklist of things you’ll need to get when adopting a cat or kitten as well as a glossary of the terms used in the book. I especially liked the way Robison has Lucky speak in his own words, giving us insights into feline instincts and behavior, and a feeling for what a cat actually is thinking. She also covers the differences and advantages of having a cat be an indoors or outdoors cat, and demystifies some of the scarier aspects of taking a companion animal to the vet. This is a marvelous primer for families to read and discuss when considering adopting a companion animal. It’s informative and written in a way that makes it accessible to young and older kids alike. The Legend of Lucky: Everything You Need To Know Before You Get A Cat is most highly recommended.